Due to the recent difficulty of accessing Lipitor from Canada, Norphar is now making Lipitor available from New Zealand (manufactured by Pfizer, in unopened factory sealed packages). If you are ordering additional drugs along with Lipitor in the same order, you will receive the drugs ordered from New Zealand in a separate package with no additional shipping charges. Orders shipped from New Zealand will arrive in about the same 10 to 14 day period that our regular shipments take from Canada and may arrive sooner. 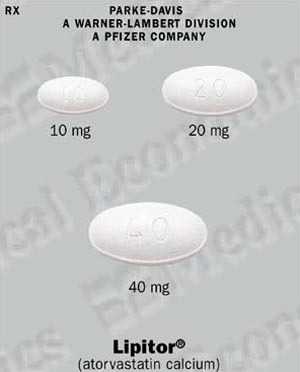 Lipitor an oral atorvastatin calcium belongs to a class of cholesterol lowering agents called 3-hydroxy-3-methylglutaryl (HMG)-CoA reductase inhibitors. Lipitor is used in combination with diet modification to treat primary hypercholesterolemia in those at risk for coronary artery disease who have not responded to other treatments alone. Lipitor works by blocking activity of HMG-CoA reductase, an enzyme vital in the synthesis of cholesterol. Lipitor is used in combination with diet modification to lower total and LDL cholesterol levels, apolipoprotein B, and triglyceride levels in the treatment of primary hypercholesterolemia (heterozygous familial and nonfamilial) and mixed dyslipidemia (Frederickson Types lla and llb). Lipitor is used in combination with other lipid reduction therapies or when those therapies are not available, to reduce total and LDL cholesterol levels in the treatment of homozygous familial hypercholesterolemia. Any of the following may be reason to choose a different drug from Lipitor. Inform your doctor before starting therapy with Lipitor. Lipitor dosages may require modification to adjust for individual sensitivities and associated medical conditions . Patients should be placed on a cholesterol-lowering diet before therapy and continued throughout therapy with Lipitor. For primary hypercholesterolemia: 10 to 80 mg per day. Lipid levels should be monitored 2 to 4 weeks after starting therapy. For homozygous familial hypercholesterolemia: 10 to 80 mg per day. Follow the adult Lipitor dosage, unless a reduced regimen is recommended by your physician.If You Miss a Dose of Lipitor, take as soon as possible. If too close to the next Lipitor dose, skip and take next dose. Do not double next dose of Lipitor. Before starting Lipitor therapy, an attempt should be made to control hypercholesterolemia with diet, exercise, and a weight reduction regimen if you are obese. Myopathy, as well as rhabdomyolysis with acute renal failure, has been reported in some other HMG-CoA Reductase Inhibitors (the "statin" drugs), and can be a risk factor with Lipitor as well. The risk of myopathy in other drugs of this class is shown to be increased with the concurrent use of mibefradil, erythromycin, cyclosporine, niacin, fibric acid derivatives, or azole antifungals. This risk should be considered and weighed against the potential benefits of Lipitor therapy if Lipitor is to be used concurrently with any of these drugs. Consult your physician about blood tests monitoring the liver function. Liver function tests should be performed before the initiation of treatment with Lipitor and periodically thereafter. Patients who develop abnormalities will be monitored until they are resolved, or a reduction of dose or withdrawal of Lipitor is recommended by a physician. Norphar offers Lipitore, Lipitor from Canada priced in American dollars for people whose insurance covers prescription medication from Canada i.e. United Healthcare. Our service is also for people in the U.S. that are uninsured or on Medicare that are underinsured for prescription medication. The prices and terms set forth on this page are subject to change without notice. Please consult a Norphar representative for specific prices and terms for each medication.